Home > Law Books > Treatises > Georgia Property and Liability Insurance Law, 2018 ed. 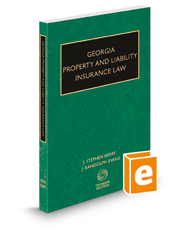 Georgia Property and Liability Insurance Law, 2018 ed. Georgia Property and Liability Insurance Law provides comprehensive coverage of commercial general liability (CGL) and professional liability policies, delving into individual policy terms and how the courts have interpreted them. This book gives you the law you need to know, since most attorneys' practices will, at one time or another, have to deal with first-party property coverage or a CGL insurance policy.